Thousands of weapons and munitions collected from former rebels have been destroyed in Ituri district of northeastern Democratic Republic of Congo (DRC) as part of an ongoing disarmament process, officials said. The weapons were collected by the United Nations Mission in Congo (MONUC) and the DRC army (Forces armées de la République Démocratique du Congo, FARDC) during two disarmament periods from September 2004 to June 2005 and from June to September 2006. Speaking during the destruction on 22 May, Marie-France Desjardins, a specialist in the reduction of light weapons at the UN Development Programme (UNDP), said: "It is the sign of the beginning of peace because these arms would have killed people." Thousands of people attended the ceremony in Bunia, Ituri's administrative centre, where more than 55,000 munitions were also destroyed. "All the arms and munitions judged in a good state have been transferred to the FARDC," Desjardins added. "The munitions are destroyed in a special oven manufactured to make them explode in a safe way," said Brian Lewis, project manager in DRC of the South African Mechem demining company, which is working with UNDP. 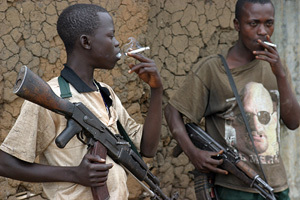 According to the Commission Nationale de Désarmement, more than 22,000 adults from all armed groups in Ituri have participated in the disarmament process. At least 100,000 arms, including Kalashnikov guns, have been recovered since the programme started. Also recovered were 1,500 bombs, 1,000 mines, 4,300 magazines, 715,000 munitions and a large quantity of various military materials, including more than 600 radios. Former fighters have welcomed the disarmament. "The arms that we have taken in Ituri have not helped us," one of them said. "We have killed each other. It is easy to destroy but hard to build; our friends who are in the bush must dispose of their arms." The forum des mamans de l’Ituri (FOMI), a platform of local NGOs for women, said the removal of arms in the region would make it safer. "We, the mothers, have been very disturbed by these arms. We could not go to the market or to fields. Many people have been injured because of these arms," a member of the forum said. In May, 223 former fighters of the Front des nationalistes et intégrationnistes (FNI) militia, whose leader, Peter Karim, was made a colonel in the national army in October 2006, surrendered their arms in Doi village, near the town of Kpandroma, northwest of Bunia. The fighters included children. The disarmament programme aims to build peace in Ituri but still has some way to go. "There is still are a large number of arms in circulation," Col Marcel Ekuba, FARDC commanding officer in Ituri, said. "We will continue to look for them."